Old homes can have a lot of charm. Old pipes don't contribute to that charm. New Jersey is one of the original 13 colonies that first made up the United States of America, and we have the beautiful, and very old architectural charm to back that up. We're not suggesting that you walk away from that beautiful Victorian with the wrap-around porch and matured rose bushes. We simply want you to be prepared for what lies in the walls of your older home. And we're not just talking about the 100+ year old homes with plaster and lath walls. In the world of plumbing, anything older than 1960 is likely using galvanized piping. It's likely that some of that piping has been swapped out over the years, but it's important to keep an eye out for those areas that have not. Listen to the water heater. Is it constantly running? That could be a sign of a leak in the system. Check water pressure. Any decrease in water pressure may be a sign of a leak. You may notice this first with hot water pressure, but cold water pipes are also liable to fail. Check the water bill. A spike in usage can hurt your wallet much more than the numbers on that bill indicate. What Kind of Sewer Lines do You Have? Whether you have a septic and are responsible for the length of the sewer line to the tank, or have public sewer and are responsible as far as the hookup to the mainline (which can often be under the street itself,) as the homeowner, you will be responsible for those lines. In addition to old age and corrosion, sewer lines can be compromised by tree roots. If there are large trees within 20 feet of your sewer line (or more, depending on the tree) you could be facing major problems in the future, if they're not silently causing one as we speak. The longevity of your sewer pipes will be greatly dependent on what they are made of. Each of the common pipe materials have different expected useful lives, though external factors such as climate and the vicinity of trees can shorten the lifespan of the pipe. Transite Sewer Pipes: Also known as AC Pipes (Asbestos-Cement Pipes.) These were installed primarily between the 50's and 70's, and while relatively resistant to corrosion, the technology for connecting these pipes was not as reliable then as today, which can lead to leaks and failures at the joints. The lifespan of these pipes is about 70 years. If you have a 1950 pipe, then look out for failure after the year 2020. Clay Sewer Pipes: Clay pipes typically last between 50-60 years. They have been in use since about 4000 BC in the widely agreed upon birthplace of city plumbing: Babylonia. While you are not likely to find any Babylonian age clay pipes, it's not uncommon to find these in homes built prior to the 50's and occasionally in homes as late as the 70's. Cast Iron Sewer Pipes: These were installed most often between the 50's and 70's and will last 75-100 years in most residential applications, so you can expect your 1950 Cast Iron Pipe to fail as early as the year 2025. Orangeburg Sewer Pipes: These pipes begin to deform after 30 years and tend to fail after 50. Orangeburg pipe was used from 1860 until the 1972. If you have an orangeburg pipe, you should anticipate a failure in the next few years. Lead Sewer Pipes: Lead sewer pipes can last 100 years, but they are not without their dangers. Lead pipes are gray in color and can be easily scratched with a knife. If you have lead pipes, you will want to replace them immediately, as they can leach lead into the water supply. PVC Sewer Pipes: If you have PVC sewer pipes, thank your lucky stars. These pipes should last a good 100 years. PVC started rolling out in the 40s, so the year 2040, if you have a 1940's PVC pipe, is when you need to start worrying. (However, failure to take care of your pipes properly can always result in an early failure. Read More About Sewer Lines in Old Homes Here. Older homes, prior to 1960 are often galvanized pipes. While previous homeowners may have replaced pipes that were corroded or clogged, that leaves many more that may be damaged or rusted that will need replacing. An easy way to check is turn on your hot water, as they hot water pipes are the first to rust. If the pressure is low, this could be a sign of problems with your galvanized pipes. These may look beautiful, but everything has a lifespan. With constant use, these old fixtures will go through the normal process of wear and tear, leading to leaks and inefficient water flow. When renovating an older home, replace old fixtures with more efficient ones that help conserve water. • Hard water – Pipes that are well maintained may last longer. Hard water does and will take a toll on pipes. Brass supply pipes can last between 40 to 70+ years. Copper pipes can last in excess of 50 years. Galvanized steel pipes can last between 20 and 50 years. Cast iron drain lines have a lifespan of 75 to 100 years. Lead pipes, used in the early 1900s, have a life expectancy of 100 years. PVC drain lines will last indefinitely. You have to think about the age of the home plumbing as well as the wallpaper you want to remove. 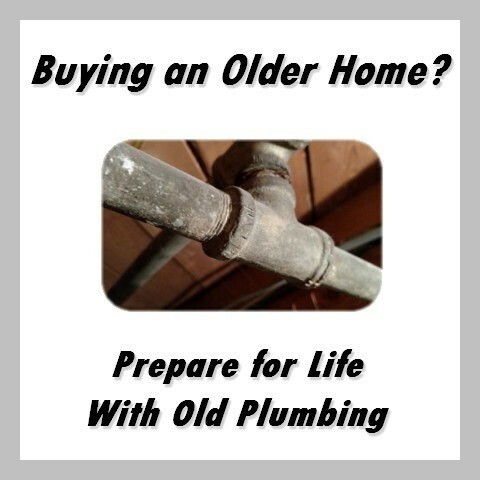 Jersey Plumbing can help with those plumbing choices so you can truly have the older home of your dreams. The Best Prevention for Pipe Disasters is to Identify the problems before they happen, and have a licensed plumber from Jersey Plumbing Service replace any sections of pipe that aren't performing well, or that are heading for failure. Be sure to insure your water and sewer lines from the city if you have city water. It's far better to pay a deductible, than the cost of tearing up the ground from the house... sometimes to halfway under the street.